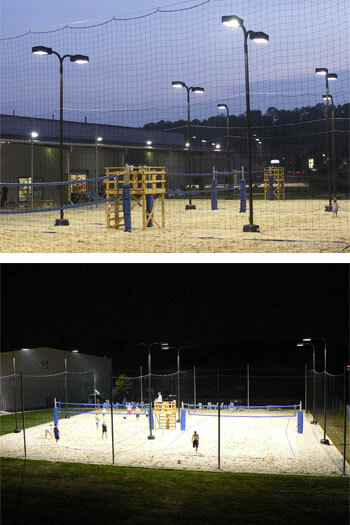 Grand Sands All Season Beach Volleyball is the first indoor / outdoor sand facility in Ohio. The facility includes five outdoor courts are illuminated with the Courtsider XL system from LSI Industries. Using four fixtures per court with 750-watt pulse start metal halide lamps, the lighting system provides a maintained light level of 40 foot-candles. Mounted at 25’, the Courtsider XL fixtures uniformly light the courts with minimal spill light outside of the court boundaries.